Please send examples of research projects being conducted in the lab to lab staff for inclusion on this page. The THz and millimeterwave metamaterials are fabricated successfully at wafer scale on flexible substrates. 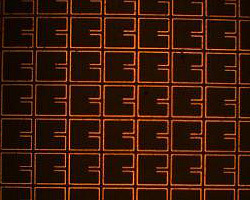 The metamaterials are fabricated on different flexible substrates using standard deep UV photolithography patterning, gold metalization and liftoff process. The critical dimension is 15 um. Floating element surface shear force sensors are under development for aerospace applications. These sensors detect surface shear by measuring a capacitance change for a deflecting shuttle. The sensors under development include active feedback control for rebalancing of the shuttle in an effort to extend dynamic range, reduce nonlinearities, and reject disturbances. With Spirit Aerosystems. Student: Zhengxin Zhao, ME PhD student. 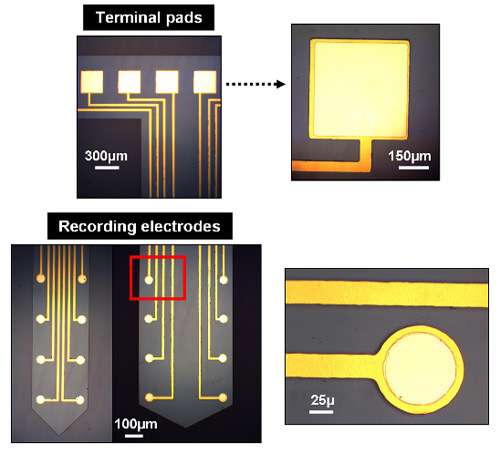 A flexible multi-electrode array intended for high resolution electromyographic (EMG) recordings has been fabricated using Parylene C as substrate material. The fabrication protocol comprises vapor deposition of parylene C, standard photolithography, sputtering deposition and reactive ion etching. 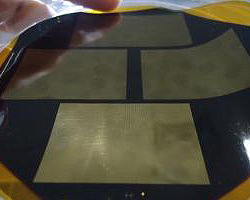 The thickness of the final devices is <20μm, while the radius of the recording electrodes is 40μm. The devices have been successfully tested in vivo in the model system Manduca sexta. Student: Cinzia Metallo, Neuroscience PhD student. MEMS shear sensor and shear sensor arrays for surface shear force measurement are under development. The shear sensor consists of 80 µm high SU-8 posts resting on a polysilicon base. A capacitive sensing scheme is used for detecting the vector force applied to this post. Different size hair-sensors and hair-sensor layouts are designed. The sensitivity and dynamic range of each design are computed. Predicted dynamic range is on the order of 60 dB. The most sensitive design is expected to measure shear forces on the order of 0.1 Pa in a 500 Hz band. Fabrication combines the polyMUMPS foundry process with post-processing at Tufts. Characterization is ongoing. Major support from Spirit Aerosystems with additional funding from NASA and DARPA. Student: Shuangqin Liu, ME PhD student. 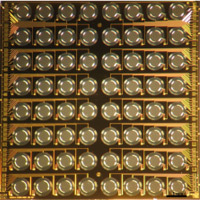 Microscope picture of the hair sensor arrays. These are 80 micron high posts with all the associated capacitive readouts. 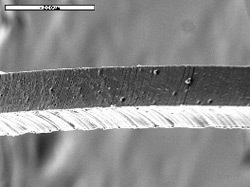 Copper nanowires (with a thin copper oxide sheath) were grown on a silver substrate for use as the gate in experimental crossed-nanowire transistors. The nanowires are grown by the electroplating of copper through anodized aluminum templates, which were later etched. The nanowires are ~150nm in diameter and 5um in length. Other potential applications include anodes in super-capacitors, frictional elements, and high surface area electrodes for sensing. Student: Sam MacNaughton, ECE MS student. Design, fabrication, and characterization of a surface micromachined, front-vented, 64 channel (8X8), capacitively sensed pressure sensor array is underway. 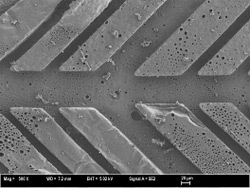 The array was fabricated using the MEMSCAP PolyMUMPs process, a three layer polysilicon surface micromachining process with additional postprocessing fabrication steps (release, packaging, Parylene coating) carried out at Tufts. Acoustic sensitivity studies show single element acoustic sensitivity of 0.7 mV/Pa from 200 to 20 kHz. Student: Joshua Krause, ME PhD student. 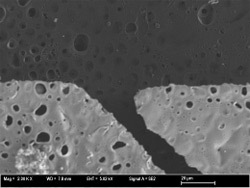 Light microscope image of the array (left) and SEM image of a single element (right). The elements are made of 3.5 micron thick polysilicon with a 2 micron air gap to the bottom electrode. The wires (and writing) are Cr/Au on polysilicon. Element diameter is 0.6 mm and pitch is 1.3 mm. Lab-on-a-chip devices have become increasingly popular as quick and easy diagnostic and experimental tools due to their size, flexibility in application, and relative ease of manufacturing and use. 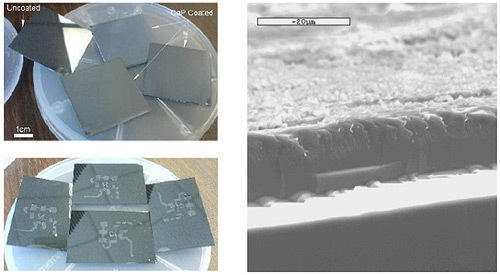 The development of customizable lab-on-a-chip features, such as surface patterning or coatings, can have widespread application. 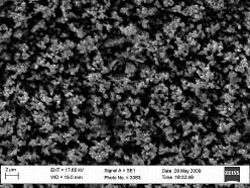 This research established low-cost and simple calcium phosphate coating capabilities on a silicon wafer using electrophoretic deposition, as well as the ability to pattern such a coated wafer with photoresist. The coated and patterned wafer was used to evaluate the ability of bone cells to adhere to a microchannel surface under flow, or dynamic seeding conditions. Student: Erica Belmont, ME MS student. There is enormous potential for biopolymers in MEMS applications. 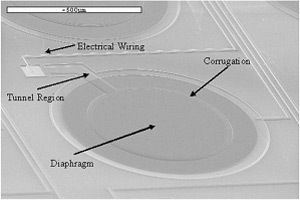 In MEMS devices biopolymers could function as membranes or optical components. Devices which demand outstanding biocompatibility, such as implantable sensors, could be packed in or fully manufactured from biopolymers materials. The challenge today exists in understanding critical processing parameters in manufacturing structures with micron and submicron level features from biopolymers. In this research, the development of a micromolding technology, to produce microstructures from aqueous derived silk solutions is studied. In particular, well-defined cellular and tissue culture substrate (scaffold) fabrication is used as a model to study manufacturing methods. 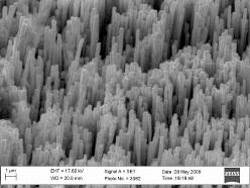 The manufacturing challenges consist in counteracting shrinkage caused by solvent evaporation, producing well defined porous structures and demolding of delicate structures. Student: Konstantinos Tsioris, ME MS student. 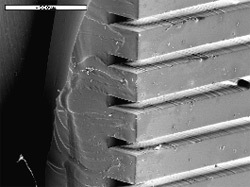 (Left) SEM image of silk fiber (crossection 100 x 100 µm) as part of well defined scaffold layer. 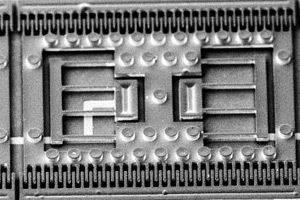 (Right) PDMS microchannel system (individual channels: width 100 µm x height 250 µm) produced with SU-8 photolithography. There is a critical clinical demand for tissue-engineered, three-dimensional constructs for tissue repair and organ replacements. Upon initial implantation, three-dimensional (3-D), tissue-engineered (TE) constructs maintain functionality and interface with the human body. In the long-term, however, necrosis occurs at the core of the construct because of limited oxygen and nutrient diffusion into the deeper layers of the TE construct. The diffusion limit of oxygen and nutrients into 3-D TE constructs is a major obstacle in the tissue engineering field. The clinical success of future 3-D TE constructs depends on developing the capability to deliver nutrients to larger systems. Student: Lindsay Wray, BME PhD student. SEM images of microchannels molded into a porous silk fibroin scaffold. Channels have widths ranging from 25 um to 300 um and depths ranging from 10 um to 150 um. 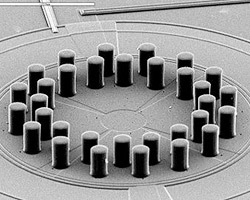 The microchannel pores are on average 2 um in diameter.